Living at the beach !! 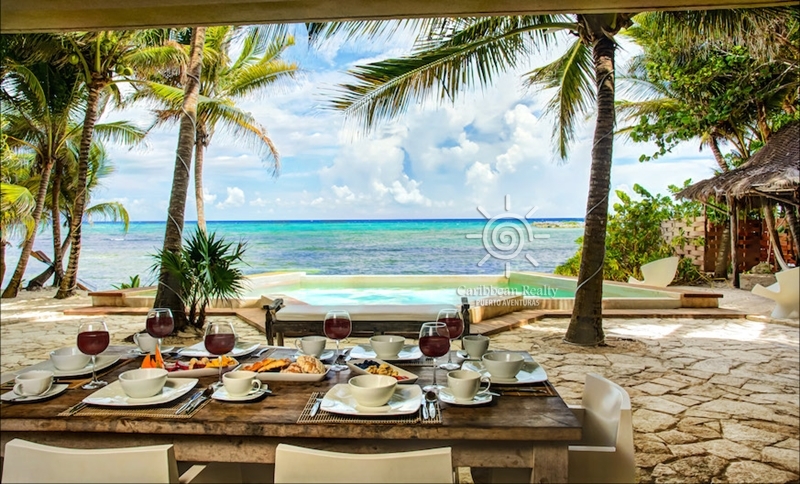 Villa Zacil Na is an impressive luxury Riviera Maya vacation home. Escape your everyday life and indulge in priceless seclusion and incredible 5-star service and amenities in a coveted location and a private beachfront setting. Enjoy 4 bedroom suites at this private rental villa, with spectacular ocean views and contemplative vibes in Mexico. Only a 45-minute car ride north of Cancun newly expanded international airport, Puerto Aventuras is a private gated resort community re-emerging as the newest address of distinction for discriminating vacation travelers. A safe haven for travelers, Puerto Aventuras offers high-end infrastructure, 24/7 Security and world-class amenities and sandy white beach. Villa Zacil Na-was built in a contemporary tropical “Palapa style” with natural and organic local materials, this beautiful home rental captures fluid transition between unrestricted spaces and nature’s beauty. Privacy is created in the bedrooms allowing for guests to feel safe and comfortable while surrounded by pure nature. Upon entering the vacation property, guests are instantly captivated by the peaceful views throughout the entire house. The spacious open living room, Palapa thatched roof, pool, and beach invite you to experience the vacation of a lifetime in a home away from home. Whether you are relaxing in your bedroom, lounging under the open Palapa living room, sipping your favorite wine, Villa Zacil Na gives a sense of continuous intimacy mixed in with organic living. Completing the ultimate holiday getaway are all of the necessary amenities for modern living in a warm climate. 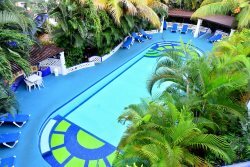 With air conditioned rooms, wireless internet service, cable television, phone, and docking station for your iPod. Villa Zacil Na, captures every amenity needed for every vacation from a work retreat to a honeymoon. The villa comes equipped with a staff that provides the attentive yet unobtrusive service that the best Mexican beach resorts are known for. The Villa cook will cater to your every culinary desire and the estate manager and concierge will accommodate your every whim and need to make sure your visit is full of leisure, comfort and adventure. Indulge yourself with spa service or participate in the adventures such is kayaking, fishing, scuba diving and snorkeling. Enjoy the natural wonder of this tropical paradise or simply improve your skills at the art of doing nothing. Whatever activities you choose, you and your family or friends will create memories to cherish for a lifetime during your stay at this beautiful Villa. With its neighbor sister villa Casa del Agua, we can accommodate larger groups of up to 18 people. Please note that although the beach is sandy, the entrance to the water is rocky. Guests are provided "water shoes" for water access. Many parts of the bay are ideal for swimming and snorkeling. Puerto Aventuras Rentals: Managed by Caribbean Realty is among the top 3 market leaders of luxury residential resort real estate in the Riviera Maya Mexico. Many properties you see are discreetly offered for sale. Contact us for a full list of the best properties in the area. Ocean view 2- First level-King bed, ensuite bathroom, A/C, cd player, ceiling fan, cable tv. Garden view 2- Ground level- 2 Twins or 1 King Bed, ensuite bathroom, A/C, cd player, ceiling fan, ensuite shower, cable tv. We request a list of favorite dishes, wines, spirits, water and other preferences from our guests so that they are received as in their own home. In short we make sure that we exceed our guests expectations.